Mast cell cancer is a common type of skin cancer that most often affects dogs 8-10 years old. Despite all of the advances in human and veterinary medicine that have taken place in recent years, hearing the word CANCER still provokes universal anxiety and fear. It’s one of those things that you can never be fully prepared for and it always seems to come as a complete surprise. You never think it will happen to your family…until one day it does. For pet guardians, it can be even more of a shock, as so many people are not even aware that cancer now affects one in three dogs. And although veterinary medicine has made remarkable strides and can now offer many of the same cancer treatments to animals that are available for humans, many pet guardians — and some vets – still assume that a cancer diagnosis is an automatic death sentence. It can be easy to let the fear take over, and let the cancer win. But cancer today is NOT a hopeless situation. And Rocky the bulldog is living proof. I was first introduced to Rocky when I received an email from his mom Linda in February 2008. She and her husband Al were looking for encouragement, and a reason to hope that this wasn’t the beginning of the end for their sweet boy. At that time, Rocky was 8 years old and had just been diagnosed with Stage II Mast Cell Cancer, which was discovered during a routine checkup at the vet. Linda says that when she first got the news that Rocky had cancer, her heart broke. “My husband was out of town and I agonized on how I was going to tell him.” Linda and her husband adored Rocky (short for Rockefella), who had first come into their lives as a wrinkly, bouncy, little puppy, just ten days after suddenly losing their beloved bulldog Waldo Peepers at 10 ½ years old. Rocky had immediately stolen their hearts and seemed destined to be part of their family from the start. By researching online, Linda learned that mast cell cancer is actually the most common fatal skin cancer in dogs, and most often affects older dogs. The tumors arise from mast cells, which are present in all tissues in the body and play a role in allergic reactions. 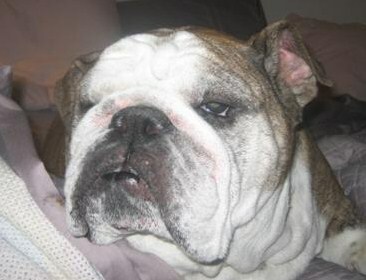 As a bulldog, and having a history of allergies, Rocky was automatically at higher risk for developing mast cell tumors, which are thought to be linked to genetics and often show up where inflammation has previously occurred. 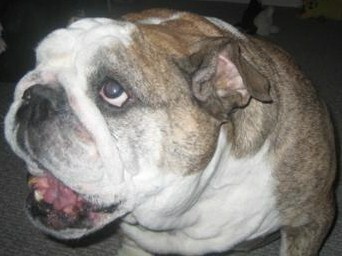 As an 8 year old bulldog, he was at an even higher risk. But who ever thinks that their dog will get cancer? Linda soon realized that it was extremely fortunate that Rocky’s vet caught the tumor on his front elbow when she did, and insisted on checking it out, as mast cell tumors are known as “the great imitators” and can be very hard to catch early. And as with most types of cancer, treatment becomes much more difficult the longer the tumors are allowed to grow before diagnosis. Thankfully, tests indicated that Rocky’s cancer had probably not spread yet, which meant that surgery was an option that could potentially save Rocky’s life. IF he made it through the procedure. Linda and Al didn’t know what the right decision was for Rocky. The risks seemed so high no matter what they chose to do. Fear can be a funny thing when it comes to treating cancer. Often, it can prompt pet guardians to take huge leaps of faith in order to save their dog’s life, like when they agree to a risky procedure or aggressive treatment protocol because NOT doing anything is a scarier prospect than attempting something that only offers a slim chance of success. Sometimes though, fear can have the opposite effect. I have encountered many families who refused to seek conventional treatment for their dog’s cancer because of fears that are often based on half-truths, misconceptions or flat out incorrect information about current veterinary cancer treatments. Or, because they are surrounded by people in their lives who tell them that “it’s just a dog,” so apparently, not a life worth trying to save. That’s why support resources like Georgia’s Legacy can be so crucial. By providing pet guardians with objective information and unwavering support of their decisions to do what they feel is best for their family, groups like Georgia’s Legacy help pet guardians navigate through the difficult journey with canine cancer and reminds them that they are not alone in the fight. Because Rocky’s cancer was caught early and the oncologist was able to achieve ‘clean margins’ during the surgery, which means that the tumor plus enough of the surrounding tissue was removed to ensure that all of the cancer cells at that site had been eliminated, no further treatment was recommended for Rocky. He was considered cancer free and could resume his normal life again. Of course, he would always need to be watched closely as mast cell tumors could show up again at any time. While it took a while for this positive news to sink in with his parents, Rocky did what dogs do best – he just kept enjoying life like nothing had ever happened, living in the moment and making the most of each day ahead of him. Rocky is now more than 2 1/2 years past his original cancer diagnosis and is still going strong. Today, more than 2 1/2 years later, Rocky continues to do well. He is now a distinguished 10 1/2 year old who loves his pampered life in sunny Las Vegas and who enjoys going on family vacations to the mountains in Northern California where he likes to explore and keep the deer and chipmunks in line. Although he had a scare with testicular cancer in late 2009, his family felt more confident this time around in their ability to handle this potential diagnosis. They immediately jumped into action by researching their options, and then agreed to surgery to have him neutered. Once again, Rocky proved what a strong and determined bulldog he is, by rebounding from surgery without any complications. Fortunately, the surgery revealed that the suspicious cells had not yet turned cancerous. If left untreated however, they likely would have at some point in the near future. Rocky is, without a doubt, a shining example of how far veterinary medicine has come in dealing with canine cancer. Every day, dogs like Rocky are able to fight, and win the battle against this disease because of the dedicated researchers and veterinary professionals who are constantly working to find better ways to identify, treat and cure cancer. But, Rocky’s story is not just about the accomplishments of modern veterinary medicine. It also about the importance of hope. When families dealing with canine cancer discover that a cancer diagnosis is NOT an automatic death sentence and have access to the information and support they need to make difficult treatment decisions, they can be better advocates for their dog, and more active partners in their dog’s veterinary care. And it’s this combination of a skilled veterinary team and committed pet guardians like Linda and Al who see dogs as very special family members, that leads to amazing success stories like Rocky’s. This entry was posted in Cancer Treatments, Stories of Courage and tagged canine cancer, canine mast cell cancer, english bulldog, las vegas veterinary referral center, mast cell cancer, rocky, sahara pines animal hospital. Bookmark the permalink.